Take full control of your virtual reality experience with the Utopia 360 Virtual Reality Headset with Bluetooth Control. Play games and interact with virtual worlds using the Universal VR Bluetooth® Controller. This 8-button remote allows for convenient in-app navigation and maximizes interaction with compatible apps. Engage all of your senses with a VR headset and Bluetooth controller. Grab yours and head on the sensory adventure of a lifetime. 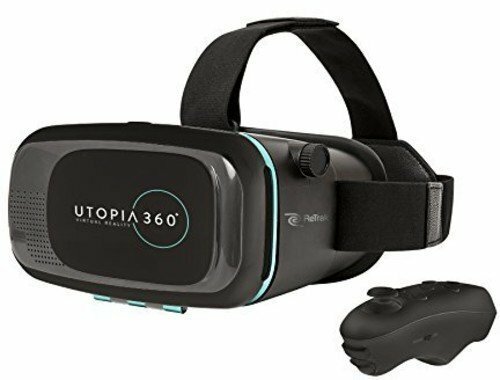 Utopia 360 is VR headset for both techies and luddites alike who have been looking to explore the popular new technology without breaking the bank. The Premier Virtual Reality experience has never been so attainable. Join the cast of your favorite films, live the action of your favorite games, and explore fantasy worlds, all with a single headset. There's more: you can ride a roller coaster without visiting a theme park, defeat enemies in life-like games, or take a tour of college campuses, historical landmarks, and natural wonders without boarding a plane. Your own living room (or wherever you decide to go) will be your playground for adventure. We simplified our headset to make it comfortable and take the pressure off when you're wearing it. The three-way strap makes it easy to adjust to your head, allowing you to take your focus off the fit so you can spend more time in another world. 6. 8-button Bluetooth® remote for a complete gaming and virtual world experience.